Dogs with ehrlichiosis can develop an acute infection that starts with fever, appetite loss and lethargy. 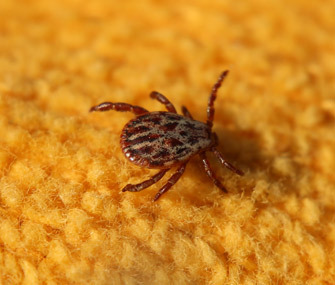 Two to four weeks after experiencing the bite of an infected tick, a subclinical infection can set in, causing thrombocytopenia. That $5 word means that the dog doesn’t have enough platelets in his blood. When that happens, he can experience bleeding into body tissues (known as petechiae) and bruising. His blood may clot more slowly than normal after an injury. Bone marrow suppression can result from chronic Ehrlichia spp. (the “spp.” refers to all species of this type of bacteria) infection. It can appear months to years after a tick bite. We use antibiotics such as doxycycline and tetracycline to go after Ehrlichia spp. They take out the bacteria by inhibiting protein production within the bacteria. In severe cases, dogs may need supportive therapy, blood transfusions and additional broad-spectrum antibiotics. Dogs with acute cases typically show improvement within 24 to 48 hours after treatment begins. Chronic cases can also respond well to treatment, but it’s not unusual for the dog to continue to have abnormal blood test results for three to six months. Your veterinarian will likely do blood work again within six months of treatment to make sure treatment was successful. Pets with ehrlichiosis can’t spread the disease to humans, but if they have the disease, it signals that people can also be at risk from tick bites. That’s why year-round tick control for animals is so important. Brown dog ticks, for instance, can survive comfortably indoors year-round. If you live in an area known to be hospitable to the aforementioned tick species, take steps to protect yourself and your pets. These include using tick-preventive collars or topical products that are safe for pets, checking pets daily for ticks and removing the suckers promptly and carefully if found, applying appropriate tick preventive products to your own exposed skin when venturing into tick territory, reducing tick habitat by keeping grass and shrubs trimmed and leaves raked, and avoiding areas where ticks hang out.